Wandera Secure - Your next generation mobile security. Our proactive multi-level security goes beyond traditional EMM to detect zero-day threats and enable automatic policy based remediation. We also identify risk exposures from data leaks and anomalous user activity. Your dashboard combines threat and device alerts, aggregate views, and global network insights. Mobile threats are continuing to evolve and your devices and company data face an increasing risk of being compromised. These range from the evolving universe of malware attacks designed to compromise mobile devices, to growing vulnerabilities, data leaks and user activity that significantly increase the risk of data loss. Secure containers, wrappers and mobile anti-virus (AV) solutions don't go far enough or deep enough to protect your organization from the emerging mobile threats facing enterprises. Pioneering multi-level approach that operates simultaneously on the device and in the cloud. Our Secure Mobile Gateway combines constant device monitoring with real-time scanning of the data stream as it passes through our in-line cloud proxy. This provides a unique and granular view into mobile activity beyond EMM, with more powerful real-time security monitoring. Advanced management and reporting portal that underpins our Secure Mobile Gateway and which provides granular real-time insights into mobile data. CSOs can get an at-a-glance view of their corporate wide security status, while administrators can benefit from prioritized actions and proactive policy control. In depth threat analysis by severity. Granular blocking and control options. Drill down forensic reports for each device. Advanced notification options for administrators and users. Top down analysis of remediations and outstanding issues. The mobile threat landscape is emerging and our security service mitigates this risk to give you peace of mind. But it is also delivered within our overall Secure Mobile Gateway which provides significant cost savings and productivity benefits from usage optimization and insights. No other security service delivers such an immediate and tangible ROI. The advantage of this multi-level approach is that our Secure Mobile Gateway can correlate data between the device and the cloud to deliver proactive security. This is powered by SmartWire, our proprietary threat intelligence engine, which detects and assesses previously unknown threats. SmartWire utilizes non-signature detection techniques and automated machine-learning to dynamically generate several hundred fine-grained heuristic parameters that build up a detailed view of each mobile data request and the associated security risk. SmartWire collects information from the device which can be analyzed and correlated with the network scanners in order to provide real-time risk scores of individual threats and specific devices. The engine capabilities include URL Reputation that assesses numerous Web page parameters, Traffic Reputation that analyzes network traffic patterns to identify suspicious traffic, and Code Reputation that examines the web and app code itself to determine if it is unusual and possibly malicious. 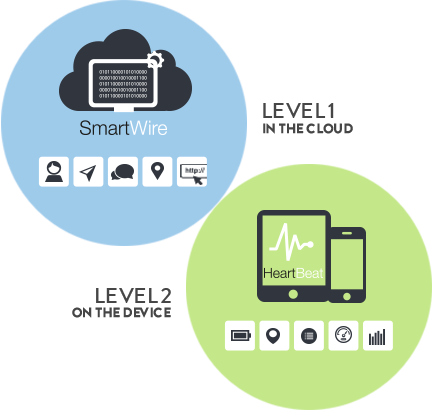 By combining multiple correlated detection technologies with the industry's largest data set, SmartWire has proven to be the industry's most effective solution against evolving mobile malware. Talk to an iRoam security expert. From concept to application, we know the ins and outs of proactively detecting and remediating mobile threats to protect your data.